The Talland School of Equitation offers an equestrian holiday for children combined in the school holidays. With over 80 horses and ponies, including advanced dressage and event horses, Talland caters for all abilities from complete beginners to international competitors. It is a great way for children to have fun with their friends and learn at the same time. Accommodation for the children can be provided on site in The Talland School of Equitation's purpose-built accommodation. Talland accommodation is in shared rooms. 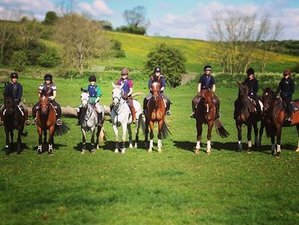 The Talland School of Equitation runs residential holiday courses for children throughout the year, but mainly in the Easter holiday and from the end of June to the end of August. The packages include accommodation on site with 24-hour supervision inclusive of meals, together with some evening entertainments and a weekend excursion for those staying longer than a week. Talland knows all of their staff well, and they are all trained in first aid and hold the necessary safeguarding qualifications. The children will ride in a group of up to six children with others of similar ability. Talland assesses all riders in the first lesson on Monday or Sunday afternoon if there was time, so, they are suitably matched for the rest of the week. The children also take a stable management lecture each day. The subject is dependent on the current level. Talland's standard course can be seen below, or they can tailor something specific for more advanced riders, or those requiring individual tuition. An additional private lesson each day is very common. 11:15 Grooming the horses, cleaning the tack, etc. This horse riding holiday will take place at The Talland School of Equitation. It is situated just outside the Gloucestershire village of Barnsley within easy reach of Cirencester, the local market town, and close to all amenities. It is also within easy reach of Swindon and Bath and only an hour and a half drive from central London. Breakfast, lunch, dinner, snacks, and drink are included in the price. Special dietary requirements can be catered for but please notify The Talland School of Equitation in advance. The Talland School of Equitation offers a range of equestrian services including adult and children regular lessons, side saddle tuition, and holiday courses. Program is available from 7th – 27th of April and 26th of June – 31st of August 2019, with arrival on Sunday.